2K announced that LeBron James, 3-time NBA champion, 4-time NBA MVP and avid NBA 2K player, will be the cover athlete for the NBA's 20th Anniversary Edition 2K19. This iconic cover features Akron's favorite son along with an artistic composition of words personally chosen by LeBron. Each of them has a special meaning for James, including "Strive for Greatness", "Determination" and "Justice". "It's touching to be on the cover that marks the 20th anniversary of a game I've played since I was little," James said. "We had the opportunity to do something really unique for this cover, which represents everything that inspires and inspires me, from my family to where I come from and the words that guide me." I am honored that my trip could be Part of this special moment in the 2K story, and I'm looking forward to the fans seeing it. " In addition to the exclusive content and elements of James, fans who purchase the 20th Anniversary Edition of NBA 2K19 will receive the game four days before, starting on September 7. "This year marks the 30th anniversary of the creation of the Visual Concepts development team and 20 years of the NBA 2K series, so it was important to commemorate this milestone by joining the most emblematic athlete of this generation, LeBron James," said Alfie Brody. , Vice President of Marketing of NBA 2K. "The careful selection of LeBron's words for the cover of the 20th anniversary of NBA 2K19 summarizes the passion and determination that has led him to prove that he is one of the greatest of all time, making him the perfect cover star "
Silicone bracelet with the words chosen by LeBron. Fans who book the 20th Anniversary Edition of NBA 2K19 in physical format in Spain will receive as a gift an exclusive Spalding ball, created especially for the occasion. 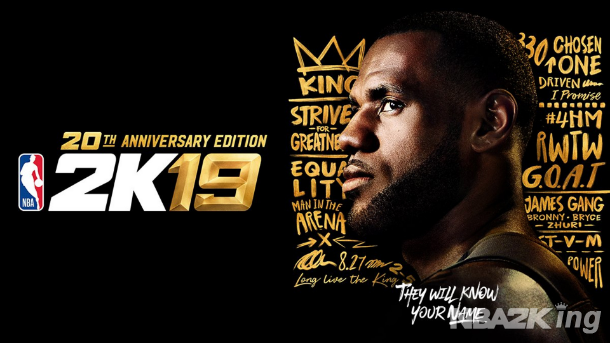 The 20th Anniversary Edition of NBA 2K19 marks the second cover appearance of the 14-time All-Star NBA. James, who currently plays in his 15th NBA season, is also a co-founder of the creative content production company SpringHill Entertainment and the digital sports media platform UNINTERRUPTED. Developed by Visual Concepts, the 20th Anniversary Edition of NBA 2K19 will be available on September 7, 2018, both in physical and digital format for PlayStation 4 and Xbox One, while it will be available only in digital format for Nintendo Switch and Windows PC. The Standard Edition of NBA 2K19 will be available on September 11, 2018 in both physical and digital format for Xbox One, PlayStation4 and Windows PC, and only in digital format for Nintendo Switch. Players who want to start their CAREER in NBA 2K19 before the launch of the game will be able to download for free "The Prologue" of NBA 2K19, a new experience that will be available as of August 31, 2018 on PlayStation 4 and Xbox One.